Hyderabad: The winners of “Megathon 2017”, the largest student Hackathon in Hyderabad are IIIT Hyderabad, IIT Hyderabad, Vardhaman College of Engineering, NIIT University-Rajasthan and SRM Univeristy. International Institute of Information Technology (IIIT-Hyderabad)’s Entrepreneur-Cell (E-Cell) hosted Megathon 2017 on 23rd – 24th September at IIIT-Hyderabad, Gachibowli Campus. It was jointly organized with IIT Hyderabad’s E-Cell. During the 24-hour hackathon, students were given 5 problem statements divided into two categories – Corporate and Social – provided by Amazon, IBM, PwC and She Team – Hyderabad Police. The problems statements covered topics like Smart Cities, Privacy and Security, Women Safety, Chat-bots and E-commerce. In each category, participating teams presented their solutions to their respective jury panels comprising industry veterans, startup founders and people from academia. The winning team walked away Rs. 20,000 cash prize and the runner-up team Rs. 10,000. In the problem statement by Amazon titled Making Selling Fun, Not My Forte team from IIIT Hyderabad emerged as winner and IIT Hyderabad Runners up. In PwC’s other problem statement of Privacy & Security Category 4thelulz team from IIIT Hyderabad emerged winner for their solution “Make product terms and conditions more readable for people using machine learning and NLP techniques so that they don’t agree to things without understanding them properly” and Renovators team from IIT Hyderabad adjudged Runner up for their idea “Honey Encryption – Instead of giving meaningless text on decryption with the wrong key, it will give fake plain-text which seems meaningful but will be wrong thus making it difficult for attackers to guess correct decryption key”. In an another challenging statement on Cybercrimes prevention, Complaint Management provided by She Team, Pastarnak team from SRM University was the Winner for their idea “An integrated offline mobile application to get connected with Police and relatives in case of emergency which also provides a platform to police for spam and image morphing detection over web” and the Foodies team from IIIT Hyderabad stood second for their solution “A central web and mobile application to register complaint, analysis of data to prioritise complaints, mark safe zones, get list of complaints which are similarly based on victim’s, demographic region and description etc by learning interesting patterns from complaints data”. 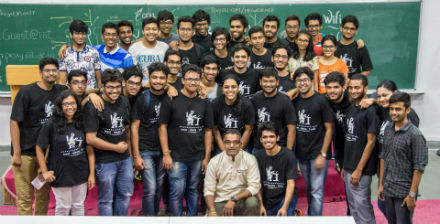 The second edition of the flagship event was the largest student hackathon in Hyderabad. A total of 185 teams, comprising of over 600 students from 65 different colleges and 35 cities across several states including Telangana, Andhra Pradesh, Tamil Nadu, Kerala, Uttar Pradesh and Maharashtra.participated in the hackathon. Multiple dignitaries including DCP Vishwa Prasad, Kalpana Saroj – CEO of Kamani Tubes & an inspiring entrepreneur, Ramesh Loganathan – Professor of Co-Innovation at IIIT Hyderabad and industry veterans from Amazon, PwC, IBM and Capgemini graced the event.